What Day Of The Week Is April 25? 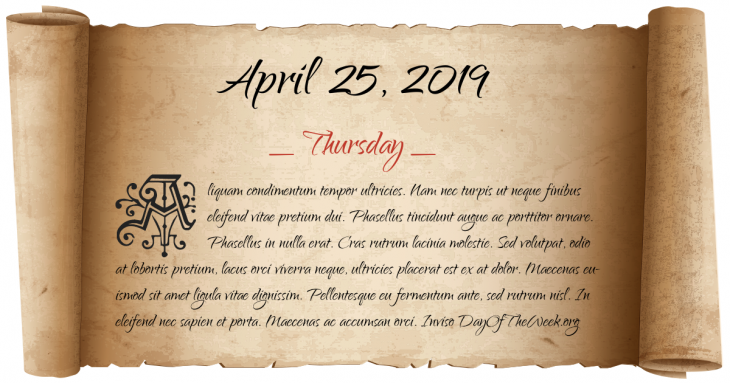 April 25, 2019 is the 115th day of the year 2019 in the Gregorian calendar. There are 250 days remaining until the end of the year. The day of the week is Thursday. Charles Fremantle arrives in HMS Challenger off the coast of modern-day Western Australia prior to declaring the Swan River Colony for the United Kingdom. Thornton Affair: Open conflict begins over the disputed border of Texas, triggering the Mexican-American War. New York becomes the first U.S. state to require automobile license plates. The Demyansk Shield for German troops in commemoration of Demyansk Pocket is instituted. The U.S. Navy submarine USS Triton completes the first submerged circumnavigation of the globe. In Israel, John Demjanuk is sentenced to death for war crimes committed in World War II. Who were born on April 25?